Election Day is Tuesday, November 6, and given the stakes of the mid-term elections this time around, you should already have plenty of reasons why you're taking the time to cast your ballot. But it looks like you just got one more -- albeit markedly less important -- reason to exercise your right to vote: free fries from Shake Shack. 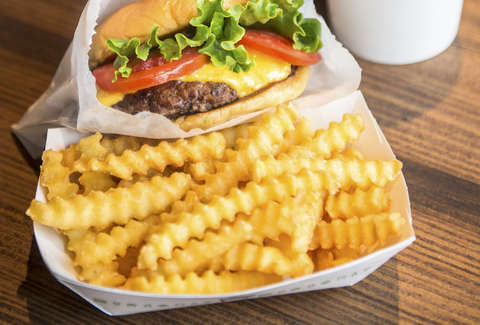 Like with other Election Day freebies, Shake Shack's free fries deal is super simple. All you have to do is head over to your local Shake Shack, proudly show your "I Voted" sticker, and they'll give you a free order of fries with any purchase, according to a spokesperson. You can also take advantage of the giveaway by ordering through the Shake Shack app with the code "ivoted," but that's admittedly not as cool as sporting the sticker -- and letting everyone know that you voted in hopes that they will do the same if they hadn't planned on doing so already. As you may recall, this isn't the first time Shake Shack has offered a perk for votes. In 2016, the better burger chain doled out for free scoops of frozen custard, including a new Pretzel-dential Caramel flavor. Several other popular chains across the country have also been known to launch similar offers for free food and drink, which may sound ridiculous because it shouldn't take free food to motivate people to participate in our democracy by voting. Then again, if a free order of fries motivates even one person to vote instead of staying home, that's a win. Tony Merevick is Senior News Editor at Thrillist and is voting on Tuesday. Send news tips to news@thrillist.com and follow him on Twitter @tonymerevick.